A Miami-area man has pleaded guilty for his part in a conspiracy to smuggle Yasiel Puig to Mexico from Cuba for a substantial cut from Puig's MLB salary. We already know about the harrowing backstory of Dodgers outfielder Yasiel Puig escaping Cuba to come to America -- including essentially being held hostage by a Mexican drug cartel under the threat of having an arm cut off by a machete -- and now one of men responsible for part of those struggles has entered a guilty plea. Per the Associated Press, Gilberto Suarez, 40, has entered a guilty plea on an alien smuggling conspiracy charge. It carries a maximum sentence of 10 years in prison, though with a plea bargain he's likely to have a lenient sentencing. Investigators and court documents say Suarez was one of the Miami-based financiers of the 2012 smuggling venture in which Puig was taken by boat from Cuba to a fishing village near Cancun, Mexico, eventually crossing into the U.S. at Brownsville, Texas, on July 3 of that year. In return, the financiers were getting a percentage of the seven-year, $42 million contract Puig signed with the Dodgers. 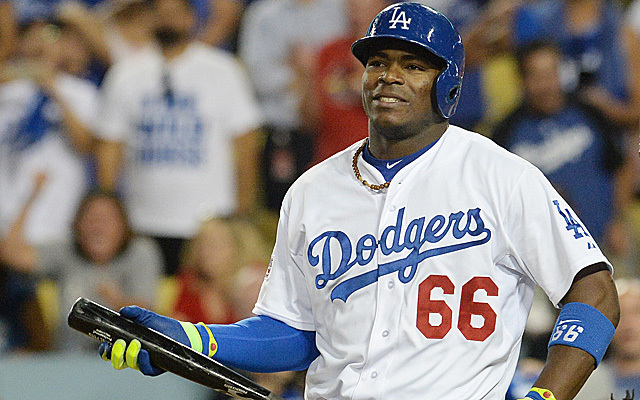 Court documents show that Suarez got $2.5 million from Puig's contract. He agreed with prosecutors to forfeit to the government a house, a condominium and a Mercedes-Benz that are traceable to the money from Puig. Suarez also is forfeiting several guns. This is a problem for many reasons, but consider that court documents have linked smuggling from Mexico a contributor to drug cartels. As for Puig, fortunately he made it here safely -- after a least five attempts and then a three-week stay with the aforementioned cartel under threat -- and legally thanks to the "foot on soil" provision. He is now getting ready for his third MLB season. Good for him.